Maruti Suzuki Ertiga clocks 32,000 bookings! The Maruti Suzuki Ertiga has clocked an impressive 32,000 bookings within the first month of its April 12, 2012 launch. The demand for the Ertiga is so high that the Maruti Suzuki will take significant time to deliver the MPV to its customers. This is primarily because Maruti Suzuki manufactures only 6,000 units of Ertiga every month. 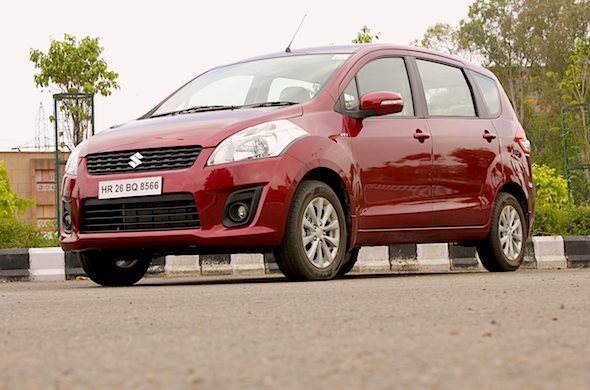 Hence, the Ertiga joins the Swift and Dzire, which are plagued with long waiting periods due to a huge demand in the car market. “Right now our team is trying to increase the capacity of the Ertiga and use the flexible manufacturing operation to give a net increase,” Mayank Pareek, Managing Executive Officer (Sales & Marketing), Maruti Suzuki was quoted as saying by NDTV. He added that the company has five manufacturing units in Gurgaon and Manesar now. Most of these units are flexible in manufacturing so Maruti Suzuki can move capacity of models from one plant to another. Pareek mentioned that Maruti Suzuki is certainly looking at increasing the price and will be reviewing it in a few months. Ertiga prices are expected to go up marginally by July 2012. In April, the Ertiga was launched with introductory prices ranging between Rs. 5.89 lakh and Rs. 8.45 lakh, ex-showroom, Delhi. Why the Ertiga is in such high demand? The Ertiga MPV comes from the largest car maker in India and is more affordable when compared with established MPVs such as the Toyota Innova and Mahindra Xylo. Being a Maruti Suzuki, the Ertiga will have low maintenance costs and good resale value. The Ertiga is high on fuel efficiency (16 kmpl for petrol version and 20.77 kmpl for diesel version) when compared with the Innova and the Xylo. Besides, the Ertiga is compact in dimensions making it easy to drive and park in urban areas. It is also easy to drive and handles like a car.